Tea parties on the ceiling? These new pawls still need to be fitted and shaped, and the eight foot hickory plank that I just acquired must be fashioned into a pair of cocking levers. All the materials for the stand are stacked in the corner and I am just waiting for a two week window in my mold making endeavors to finish Firefly to the point she will be ready for more testing. It seems like this project is swimming in delayed gratification. God! 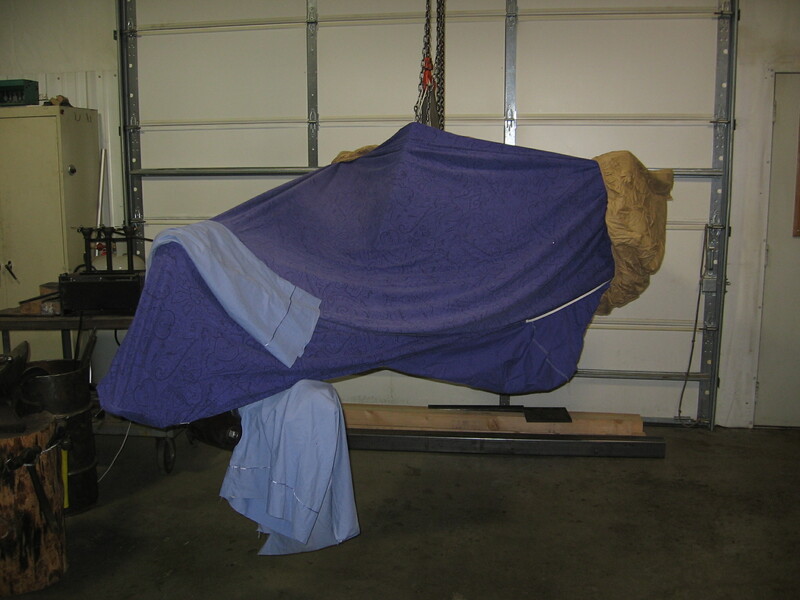 it’s gonna feel good to finally wind her up by hand. The piles of snow outside the door are weak compared to what they were a decade ago. Some say it is the sun getting hotter. Or perhaps it’s just a “natural” cycle. I have heard it said that Humans are making it hot. …….Yep, I reckon so. The world is dissolving at a fair old clip, and what am I doing? 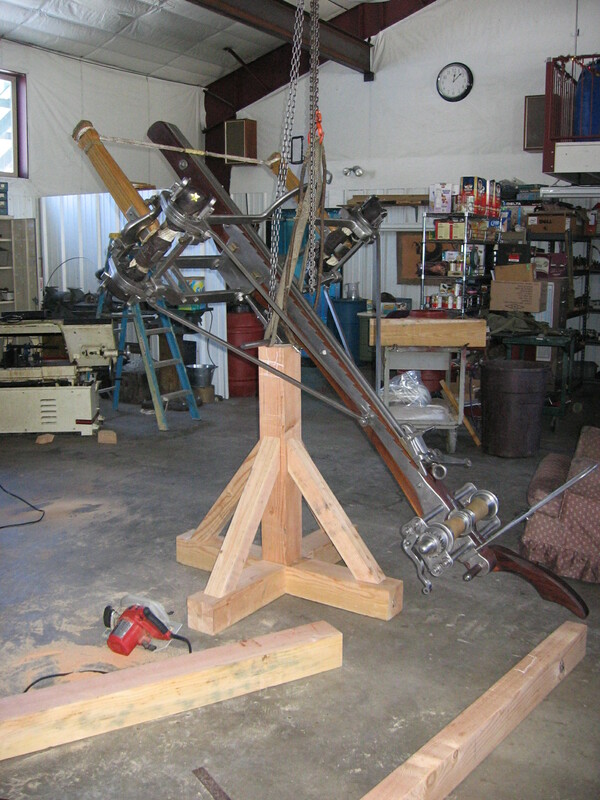 Building a fancy-dang catapult. 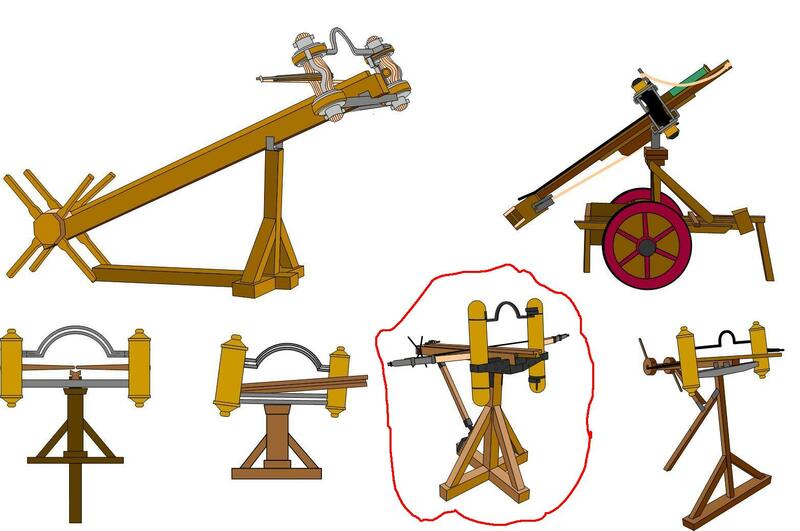 If Monty Python taught us that catapults are inherently silly objects anyway, what does this tell me about Firefly. Is she just some Titanic deck chair from the Gods? It’s a puzzlement, that’s for sure. A few thumps into this bend I started to realize what a good time I was having. Nothing like hot iron to focus the mind. Click for vid, 20110110201402(1). Firefly is having a bit of a nod in the background. She’ll probably wake up when I hang that yoke on her underbelly. The trunnion bracket is starting to grow on me. It seems that enough hot iron can mollify even the hardest heart. A malleable attitude regarding matters of taste seems the stronger and more pragmatic position. While I can’t pretend to be particularly thrilled by the looks of the trunnion bracket, it appears to work very well to shift Firefly’s center of gravity fore and aft. “Higher purpose” I tell myself, amid squeals of aesthetic condemnation. It will make more sense when we get back to some serious shooting. The rear sight is completed, and fortunately does not offend my delicate sensibilities quite so much. I’m still grooving on how nicely the two tapered ends shuck in and out of the tapered holes in the mounting blocks. Before the whah-whah crowd goes berserk at the idea of non-authentic adjusting screws on the sight, let me disclaim any pretension to a complete “purity of essence”. At this stage, there is no need to get fanatical. It’s not like we can let General Ripper run the show from his armchair or something. Must make a concerted effort to get over myself. Time to let it percolate awhile. Back in a week or so. Today I will be finishing up a special bracket arrangement that attaches to the rear of the klimakion. This is the ladder like structure than connects in to the bottom of the field frames. The bracket will allow the trunnions that form the pivot point for elevating and depressing the machine to be movable fore and aft, thus creating an adjustable center of gravity. This is an instance where we temporarily diverge from the likely Roman solution to forming this pivot point. 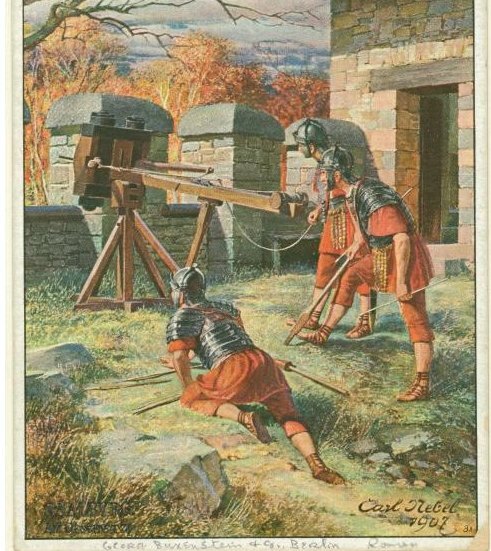 From the Cupid Gem, it appears they simply ran an iron rod through the wooden stock at the appropriate location, and called it good. Eventually Firefly will also receive that same solution, in the meantime I want to be able to fool around with the center of gravity to find out what is most desirable for some of the fluid, offhand style shooting I have in mind. It’s kind of an over-design and then work backwards approach. A similar strategy will be employed to figure out the meaning of those holes apparent on the tangs of the original kamarion. Our current reconstruction has used a simple lug and wedge system for mating the tangs to the loops on the field frames. This approach was chosen because it offered high confidence that the joint would be as strong and reliable as it could possibly be. On the firing line this will allow us to conduct tests that will demonstrate the maximum levels of power and accuracy that can reasonably be considered achievable with this type of machine. Once that is established, we can modify Firefly to explore how an approach that is more strictly interpretive of the artifacts affects performance (e.g. 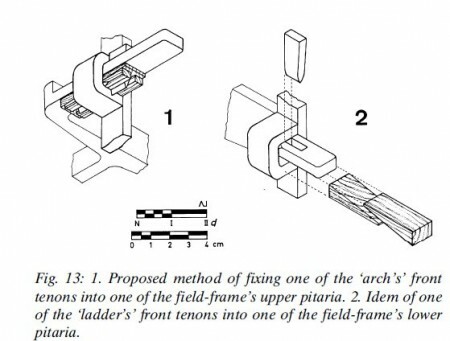 Aitor Iriarte’s suggestion seen in his diagram below). So again, short of changing the spring size, in certain key areas we have deliberately over-engineered the solutions to insure that the final performance on the firing line is as good as it possibly can be. Once that is achieved we can modify Firefly to hair split designs that may be more consistent with the strictest interpretations of the archaeological evidence. Why go to these lengths? Because every serious attempt to reconstruct an ancient two armed ballista that we have ever seen has fallen way short of the performance levels indicated by the Ancients. (No offense fellow reconstructors.) Our mission is to first secure the performance and then work backwards towards more detailed explanations similar to Aitor’s shown above. Overshoot and then regress. This is a very, very long game we are playing here. A final note: it seems some researchers have given up trying to duplicate authentic levels of power in torsion engines by claiming that the modern synthetic spring materials today’s researchers are forced to use cannot compete with the sinew used by the Ancients. My experience with three strand nylon shows this is not true if sufficient pre-load is put into the bundles. 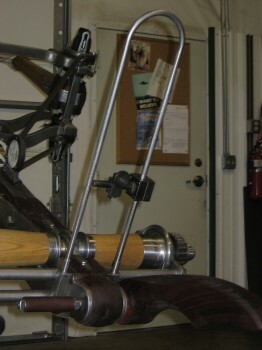 Naturally a sinew based spring would perform differently than a nylon based one, but probably not so much in the accuracy department, which, once the springs are normalized to the torsional load they must bear, is largely dependent on other factors such as the machine’s rigidity and ability to repeat it’s mechanical positioning back to the at rest state. Anyone following this blog knows that Firefly has the performance aspect well in hand. No brag, just fact. The rest of the master plan is just work. As I said, this is an excruciatingly long game, and beneath all the scribbles and bluster that I use to stay motivated, there is method to the madness. Back to grinding now………. Thanks go to Randi Richert, AKA Clodius, for providing the following sketches. At the moment I am strongly favoring the stand circled in red. The Bard abides. It must be the cabin fever. As I burnish Firefly’s shapely ankles, it occurs to me that a large proportion of human creativity has been spent not just making weaponry, but also polishing it. That is to say, we like our implements of death to be beautiful. 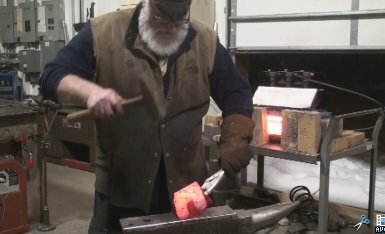 The roots of this tendency can be traced right back to prehistoric times when our ancestors from the late Paleolithic took pains to smooth and shape their spear and axe heads to a degree far in excess of what was needed to make them functional tools. It may be fair to say that the 20th century ameliorated this tendency with the rise of cheaply fabricated devices like the Sten gun or AK-47. Walnut and blued steel gave way to the ruthless efficiency of stamped metal and injection molded plastic. Modern trends aside however, it still runs deep in Homo Sapiens to polish and revere the tools they use to take life. 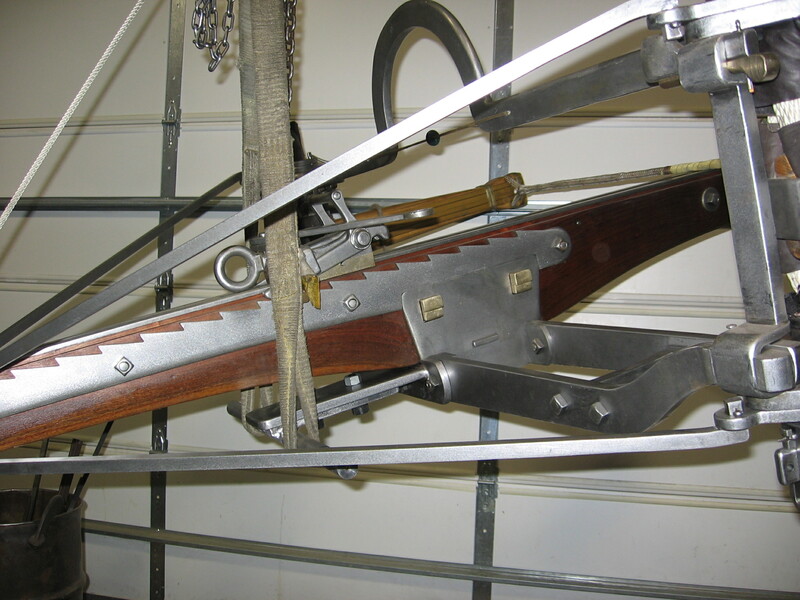 The beautification of weaponry is an ancient and largely universal tendency. Perhaps it incurred a tactical advantage by causing enemies to back down in a fight; just a testosterone fueled need to dominate through a bit of flash. After-all, what self respecting warrior would want a beauty “gap” on the field of blood? 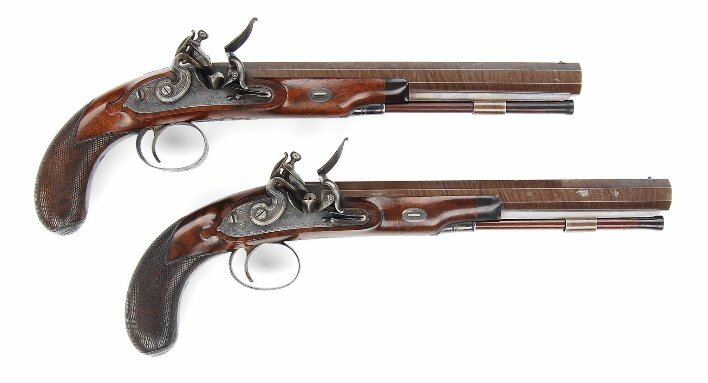 This matched set of duelling pistols is by the renowned 19th century English gunsmith, Joseph Manton. No picture can fully communicate the level of fit and finish and mechanical perfection that he achieved. These are some of the things I think about as I purchase sandpaper by the ream. Is it simple market forces propelling this obsession in our species, or is it just those polish, polish, polish genes acting out? Being weapons gay is such a drag when your fingers start bleeding. The Rebecca just blew a big raspberry over all this by suggesting that smoothing and polishing helps prevent rust. Ever a pragmatic champion for polishing the silverware, I am defeated by her eloquence and industry. Polishing resumes. Mommy, Mommy, look what Daddy made. We have here some rare footage of an ancient predator that dominated certain aspects of the late Roman battlescape. Rock out to the evil war toy, click here, 20101231224828 . When oligarchies and dictatorships start to fail, their “secret” weapons usually get shinier. It’s an extension of the bread and circuses thing. Put that in your peace pipe and smoke on it awhile.